Shake out the back-to-school lethargy in your students with this science activity guaranteed to bring down the (metaphorical) classroom roof. We would know, we tried it out ourselves. Watch: Oobleck (and the Britannica team) in Action! 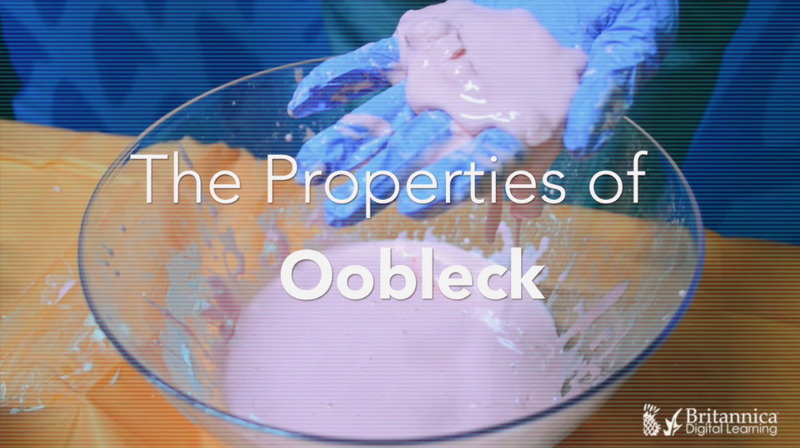 A seemingly innocuous mixture of cornstarch and water with an ingeniously onomatopoeic name, "Oobleck" is a Non-Newtonian fluid that exhibits the properties of both solids and liquids. Sir Isaac Newton theorised that individual liquids flow at consistent, predictable rates. Liquids that exhibit these properties, like water, are known as Newtonian fluids. Oobleck's viscosity however, will change depending on the force applied. It will act almost like a solid if squeezed or punched and flow like a liquid when pressure is released. Scientifically speaking, Oobleck is a suspension. This means that the grains of starch are not fully dissolved, merely suspended and the particles spread out in the water. Eventually, the corn-starch particles will separate from the water and settle in the bottom of the container as sediment. Support students' ability to measure their scientific observations enabling comparison, and representation of relationships between states of matter. Students can also extrapolate on their learning by applying it to a study of the changing states of Solids, Liquids and Gases. Develop students' scientific inquiry skills by asking them to observe, infer and conclude on the properties of Non-Newtonian fluids. See Oobleck (and the Britannica team) in Action!